Mr. Sohail Ahmed, aged 55 years, is the Chief Executive of the company, he has a practical experience over 30 years in manufecturing and marketing of textile products. He holds the office of Chief executive since 2013. Mr. Sohail Ahmed is the commerce graduate from University of Karachi. Mr. Asim Ahmed, is an Executive Director of the company. He has a practical experience over 30 years in manufacturing and marketing of textile products. He is the director of the Company since 1992. Mr. Sohail Ahmed is the commerce graduate form University of Karachi. Mst. Zubaida Khatoon, is one of the Pioneer Director of the Company. 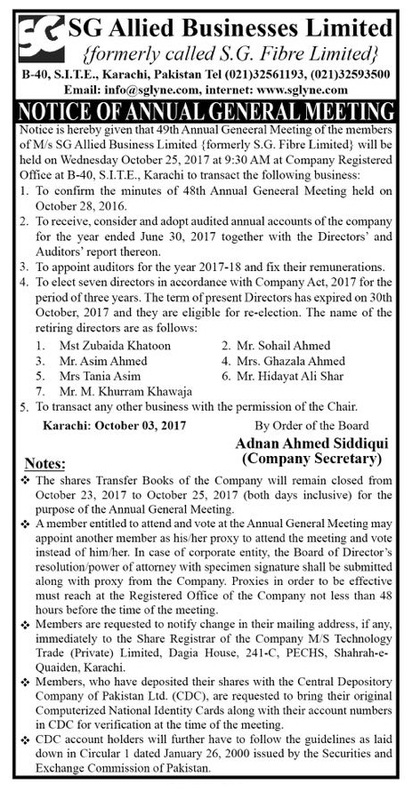 She is serving the company as Director since the formation of the company. Mrs. Tania Asim is the Director of the company since 2012. Mrs. Tania Asim is the commerce graduate form University of Karachi. Mrs. Ghazala Ahmed is the non-Executive Director of the company and is the commerce graduate from University of Karachi. Mr. Hidayat Ali Shar, is the nominee Director from National Bank of Pakistan, having rich experience of finance Sector. Mr. M Khurram Khawaja, is the nominee Director from National Bank of Pakistan, having rich experience of finance Sector.